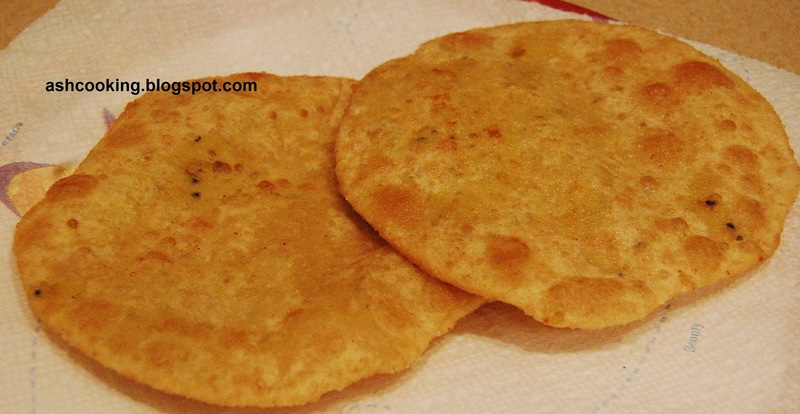 Radha Ballavi is lentil stuffed puris very popular in West Bengal on breakfast and as evening snack. Served either with Cholar Dal or Bengali Aloo Curry, they are easily available at any sweet shop in Kolkata in the morning or in the evening. Some of the choice sweet shops are so much known for the radha ballavis that within minutes of their arrival, they are all sold out for the day; a little delay resulting in returning home empty handed. Infact, I have seen people queuing in front of the shops an hour in advance to avail the soft puris in the evening, the craze matching with that of samosa (shingara in Bengali) only. It's been years after we shifted to Bangalore that I have had the opportunity to bite into my favourite snack. So helpless with the circumstances, I learned to make it on my own not willing to let go of my appetite. 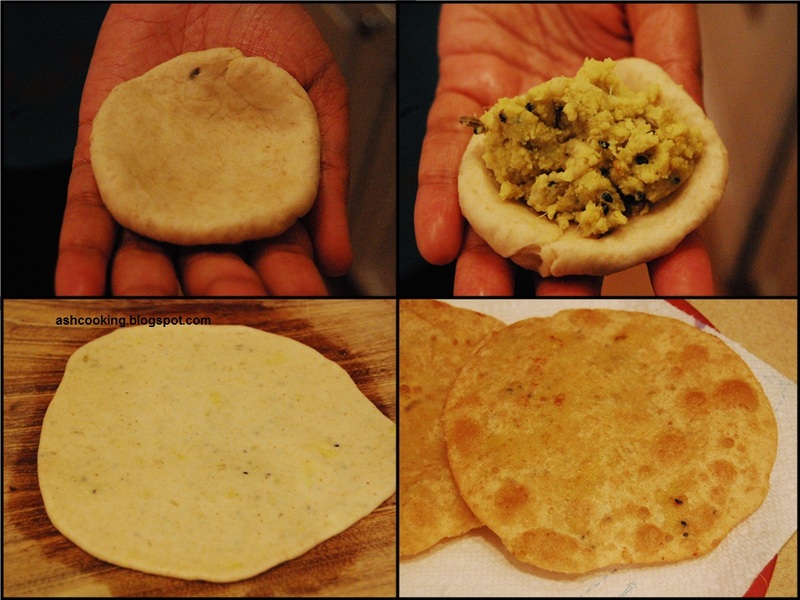 I realized one thing after I started cooking radha ballavis at home that they are quite easy in preparation compared to a lot of other snack items. 1) Heat oil in a non-stick skillet. When oil turns hot, add nigella seeds and wait till it crackles. 2) Add urad dal paste, green chilli paste, turmeric powder and salt. Cook the lentil stirring continuously on low flame for 5 minutes. When the lentil dries out and leaves the side of the skillet, take it off the flame. 3) Now taking the lentil mixture in a mixing bowl, add hing powder, fennel seeds and ginger paste to it. Mix well. 4) Using the ingredients mentioned for the dough, knead firm dough and make small balls out of it like you make for luchi or puri. 5) Put the balls in the centre of your palm, one at a time, and with the pressure of your other palm, flatten it. Then press a finger into the centre and gently rotate it, making a pocket. Put a spoonful of the lentil stuffing inside and bringing the edges together, fold it into a ball. 6) Brush the work surface with oil and using a rolling pin, roll the balls out into a circular shape of 4 inches in diameter. 7) Deep fry the Radha Bollobhis in smoking hot oil till both the sides are lightly brown. 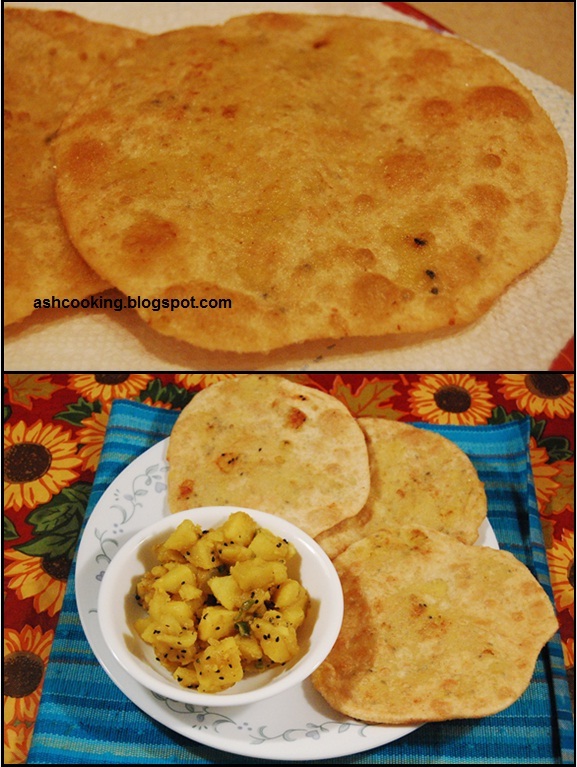 8) Serve hot with aloo curry. @ Shilpa, Happy Pujo to you too...thanks for liking my recipes.